‘The Moon – our desolate, barren satellite, last visited by man almost 40 years ago. Well, NASA has it in its sights again. This time, it plans to tap the water there! RT’s Ameera David explains what that could mean for future space exploration (9 Jan 2015)’. 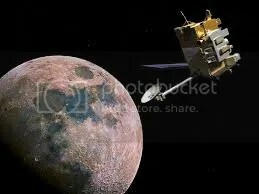 NASA’s Dr. David R. Williams writes that the “Lunar Prospector, a NASA Discovery mission, was launched into lunar orbit in January 1998. Included on Lunar Prospector is an experiment called the Neutron Spectrometer. This experiment is designed to detect minute amounts of water ice at a level of less than 0.01%. The instrument concentrated on areas near the lunar poles where it was thought these water ice deposits might be found. The Neutron Spectrometer looks for so-called “slow” (or thermal) and “intermediate” (or epithermal) neutrons which result from collisions of normal “fast” neutrons with hydrogen atoms. A significant amount of hydrogen would indicate the existence of water. The data show a distinctive 4.6 percent signature over the north polar region and a 3.0 percent signature over the south, a strong indication that water is present in both these areas. The instrument can detect water to a depth of about half a meter . . . 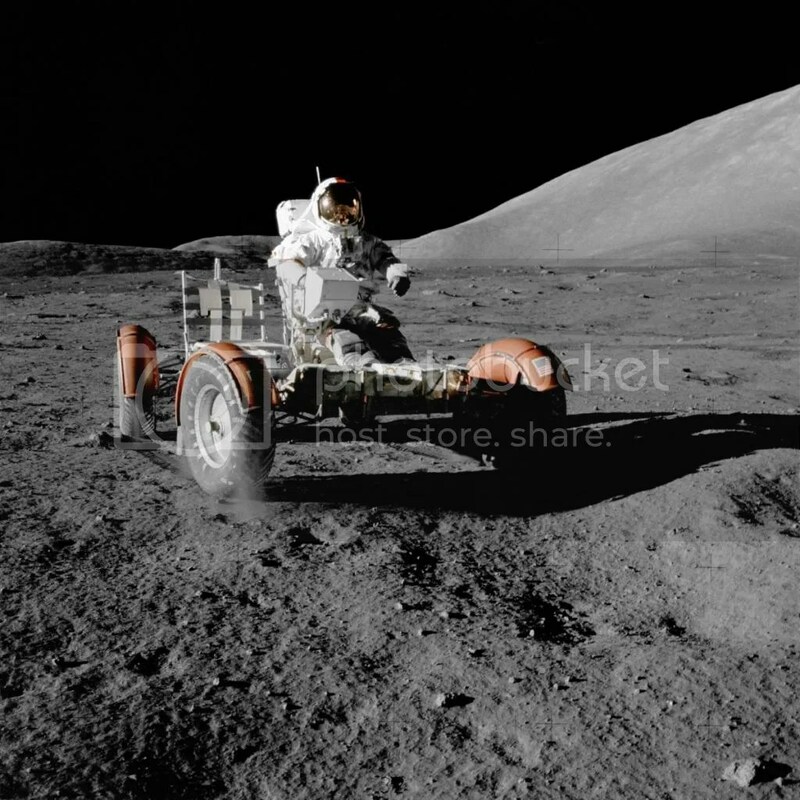 The Moon has no atmosphere, any substance on the lunar surface is exposed directly to vacuum. For water ice, this means it will rapidly sublime directly into water vapor and escape into space, as the Moon’s low gravity cannot hold gas for any appreciable time. Over the course of a lunar day (~29 Earth days), all regions of the Moon are exposed to sunlight, and the temperature on the Moon in direct sunlight reaches about 395 K (395 Kelvin, which is equal to about 250 degrees above zero F). So any ice exposed to sunlight for even a short time would be lost. The only possible way for ice to exist on the Moon would be in a permanently shadowed area . . . The Clementine imaging experiment showed that such permanently shadowed areas do exist in the bottom of deep craters near the Moon’s south pole. In fact, it appears that approximately 6000 to 15,000 square kilometers (2300 to 5800 square miles) of area around the south pole is permanently shadowed. The permanently shadowed area near the north pole appears on Clementine images to be considerably less, but the Lunar Prospector results show a much larger water-bearing area at the north pole. Much of the area around the south pole is within the South Pole-Aitken Basin (shown at left in blue on a lunar topography image), a giant impact crater 2500 km (1550 miles) in diameter and 12 km deep at its lowest point. Many smaller craters exist on the floor of this basin. Since they are down in this basin, the floors of many of these craters are never exposed to sunlight. Within these craters the temperatures would never rise above about 100 K (280 degrees below zero F). Any water ice at the bottom of the crater could probably exist for billions of years at these temperatures . . . The Moon’s surface is continuously bombarded by meteorites and micrometeorites. Many, if not most, of these impactors contain water ice, and the lunar craters show that many of these were very large objects. Any ice which survived impact would be scattered over the lunar surface. Most would be quickly vaporized by sunlight and lost to space, but some would end up inside the permanently shadowed craters, either by directly entering the crater or migrating over the surface as randomly moving individual molecules which would reach the craters and freeze there. Once inside the crater, the ice would be relatively stable, so over time the ice would collect in these “cold traps”, and be buried to some extent by meteoritic gardening. Such a possibility was suggested as early as 1961. However, loss of ice due to photodissociation, solar wind sputtering, and micrometeoroid gardening is not well quantified”. On the interwebz, NASA informs us that at ‘5:32 p.m. EDT, June 18, 2009, an United Launch Alliance Atlas V rocket roared off the launch pad at Launch Complex 41 to begin the Lunar Reconnaissance Orbiter and Lunar Crater Observation and Sensing Satellite missions to the moon. The LRO instruments return global data, such as day-night temperature maps, a global geodetic grid, high resolution color imaging and the moon’s UV albedo. However there is particular emphasis on the polar regions of the moon where continuous access to solar illumination may be possible and the prospect of water in the permanently shadowed regions at the poles may exist. Although the objectives of LRO are explorative in nature, the payload includes instruments with considerable heritage from previous planetary science missions, enabling transition, after one year, to a science phase under NASA’s Science Mission Directorate. With a comprehensive data set focused on supporting the extension of human presence in the solar system, LRO helps identify sites close to potential resources with high scientific value, favorable terrain and the environment necessary for safe future robotic and human lunar missions. All LRO initial data sets are deposited in the Planetary Data System (PDS), a publicly accessible repository of planetary science information, within six months of primary mission completion. Thereafter, the data sets will be deposited in the PDS every three months. The processed data sets will help the world develop a deeper understanding of the lunar environment, paving the way for a safe human return to the Moon and for future human exploration of our solar system. LRO is collecting detailed information about the Lunar environment. The LRO payload, comprised of six instruments and one technology demonstration, provide key data sets’. Retired Canadian astronaut Chris Hadfield states that the “moon is a rich place. It’s a museum of the early solar system and it should be thoroughly explored”, and significantly adding that “[i]f it turns out there are large water deposits in some of these craters in the moon, we could turn that into rocket fuel and transform the economics of space travel”, obviously unaware of the results of the Lunar Prospector mission of yesteryear. The science journalists Jennifer Welsh and Jessica Orwig explain that a “study in 2012 suggested possible evidence for the existence of ice in the lunar crater Shackleton Crater, but more investigations are necessary to ultimately determine if this crater, as well as others on the moon, hold enough ice to fuel future rockets. A manned mission could readily collect samples to determine this. If that isn’t incentive enough, [former NASA astronaut Jeffrey A.] Hoffman advises, consider just how long it has been since humankind has set foot on any natural body besides Earth. In fact, it has been more than 45 years since Neil Armstrong and Buzz Aldrin first set foot on the moon”.
 . David R. Williams, “Ice on the Moon. A Summary of Clementine and Lunar Prospector Results” NASA. (10 December 2012). http://nssdc.gsfc.nasa.gov/planetary/ice/ice_moon.html. “The LRO Mission” NASA. http://lunar.gsfc.nasa.gov/mission.html. Jennifer Welsh and Jessica Orwig , “NASA Astronaut: Why We Need To Visit The Moon, Not Mars”.